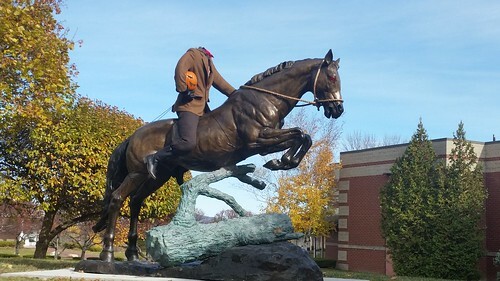 A horse statue with a headless horseman put on top of it has part of Halloween decorations at Colby-Sawyer College. Who knows if they do this every year, but while hitting a conference at the college, it was great to stumble upon this statue and chuckle at the homage. It's interesting that those almost 200 years old, the story can still evoke the desire by students (or administrators/faculty?) to invoke the famous tale. I'm sure that the loosely based TV show is likely to have something to do with it, but I'm guessing this has been a pretty frequent occurence over the years. The statue as a whole is fascinating and makes me wonder what does a horse leaping over a tree stump have to do with the college.